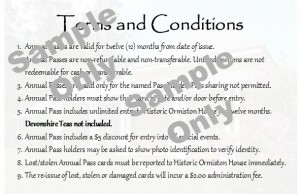 Historic Ormiston House is pleased to announce that from 2017, annual passes are available for purchase for only $50. This includes unlimited entry into Historic Ormiston House for twelve months (entry only) and a $5 discount on entry into special events. Please note: Devonshire Teas are not included in the annual pass. 1. Annual Passes are valid for twelve (12) months from date of issue. 2. Annual Passes are non-refundable and non-transferable. Unused portions are not redeemable for cash or transferrable. 3. Annual Passes are valid only for the named Pass Holder. Pass sharing not permitted. 4. Annual Pass holders must show their card at gate and/or door before entry. 5. 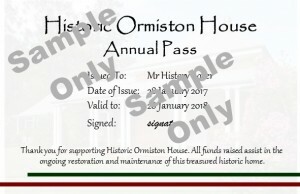 Annual Pass includes unlimited entry to Historic Ormiston House for twelve months on general Sundays or group weekday tours (available by appointment only). Devonshire Teas are not included. 6. Annual Pass includes a $5 discount for entry into all special events. 7. Annual Pass holders may be asked to show photo identification to verify identity. 8. Lost/stolen Annual Pass cards must be reported to Historic Ormiston House immediately. 9. The re-issue of lost, stolen or damaged cards will incur a $2.00 administration fee.